Prior to the rise of Islam in the seventh century, the power which most effectively matched the Byzantine Empire in the east was the Sasanian Persian Empire, based around the areas of modern Iran and Iraq, and centred on its capital city of Ktesiphon, near modern Baghdad. In comparison to the Byzantine Empire, little is known about the internal working of the Sasanian state since it left few written records and archaeology in the region has been complicated in the last half a century by political circumstances. Nevertheless, it is clear that the Sasanian Empire was wealthy and militarily powerful. This was in part due to its trade links with the Arabian incense trade and its control of silk imports from China. Its silver currency appears in large quantities on archaeological sites in Central Asia along the so-called ‘Silk Road’. Like Byzantine coinage, Sasanian silver dirhams carried an imperial portrait. The headdress of the Shah-an-shah (King of Kings) appears to have reflected the loyalty of the particular monarch to specific deities. 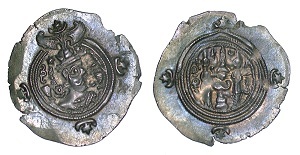 Reverse images usually depict two figures honouring a fire altar. The Sasanian state was based on the Zoroastrian faith, a dualist religion which sees the world as a battleground between competing forces of light and darkness. Fire worship was, therefore, a crucial element of state ritual. This dirham of Khusrau II (AD 590-628), the last significant Sasanian Shah, clearly shows the imperial portrait and the stylized depiction of a fire altar.